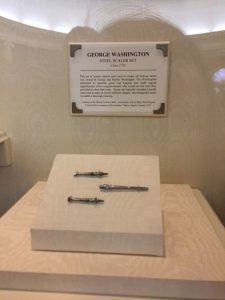 Did you know that the Hall of Presidents at Walt Disney World hosts George and Martha Washington’s scalers (those things that scrape at and clean your teeth) in its lobby? Neither did I, until I saw them there on vacation a couple of weeks ago (Take a look at the picture on the right if you don’t believe me.). I have to admit I was surprised, and not just because someone’s personal dental instruments were on display (somehow those seem like odd picks for a museum, but it might just be me). ….Because didn’t George Washington have wooden teeth? Actually, they were made of ivory… and cadaver teeth. Yep, his dentures were essentially a teeth transplant. And they stained very easily. So yes, he had to clean them, but with wax, chalk, pine and cedar, and an unspecified “broth”, according to this article hosted by Mount Vernon. Lovely. Suddenly I am a thousand times more thankful for toothpaste, prosthetics, and modern denture solutions. Want to learn more fun facts about our presidents’ teeth? Of course you do. And we’ve got you covered – just keep reading! The president has his own dental office inside the White House! How many of us have wished, when our teeth are in pain, that the doctor could just come to us? For the president, that dream is a reality. Since Herbert Hoover’s presidency during the Great Depression, the White House has been equipped with its own dental office, prepped and ready for any kind of dental emergency the president might face. Now I know what my next home improvement plans will involve. Grover Cleveland had dental surgery performed on a yacht. I’d also be fine with having dental surgery on a yacht, though I’m sure our 22nd president didn’t get to relax much while his dentists removed a cancerous tumor and five teeth from his mouth. As far as we know, there’s no secret dental yacht still present today, but this still makes for a great story… and a great reminder to get those oral cancer screenings at your checkups! Dwight Eisenhower’s teeth helped cover up an alien encounter. …Maybe. The jury’s still out on that one. He reportedly underwent emergency dental treatment after he lost a crown, but since the treating dentist died without leaving a record of the visit, many suspect that the president was instead holding a top-secret meeting with aliens. Naturally. Lyndon B. Johnson gave away electric toothbrush sets with the presidential seal on them. And we always thought the personalized office toothbrushes in our patients’ goody bags were neat. When asked about his unique gift, LBJ said, “I want people to think of me right away when they wake up and right before they go to bed.” Awww. You can learn more at the LBJ Presidential Library website. JFK’s teeth saved a fellow soldier from drowning during World War II. After their PT boat was sunk by a Japanese destroyer, President John F. Kennedy towed a fellow shipmate to safety by holding his life jacket between his teeth. The feat took four hours and three miles to accomplish, according to the shipmate’s obituary in the Los Angeles Times! Gives you a newfound appreciation for what your teeth can do, doesn’t it? They’re practically superheroes. Celebrate this Presidents’ Day by treating yourself to a dental checkup, and maybe you can add your teeth to this crazy list!